Hamburgers are a favorite of many and are pretty easy to prepare. Here in South Louisiana we're always taking the usual and making it unusually good. Homemade Hamburgers are subject to this treatment! We'll twist this one up some and see if we can make our taste buds smile the Cajun way! As a general rule it takes about 1/2 pound of meat to make a decent sized burger that will fit on a large bun. Remove the sausage from the casing and combine both meats in a bowl. Now let's season it. Adjust the following to your taste. Combine everything with the meat and mix well. Let the mixture rest in the ice box for about an hour to let the seasonings dissolve some. Read more on keeping those burgers together. 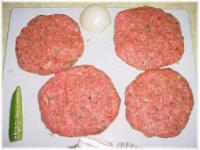 Form the hamburger patties as usual and make them about 3/4" larger than the bun. The burgers will shrink so doing this will give you a "bun-fitting" hamburger patty. Cook the hamburgers on a high heat on each side for about a minute, then, finish them on a med low heat until done. The USDA says to cook hamburgers until an internal temperature of 160ºF is achieved. When they're done spray them on both sides with a water mist and sprinkle a little salt on them. Put the patties in a pan with enough water to cover the bottom. Keep them covered so they don't dry out. Doing all of this will give you a slightly moister hamburger patty. To change this up even more use french bread instead of hamburger buns. Consider spreading a thin coating of butter on the bun and warming them over the fire. You can also sauté some thinly sliced onion in butter and Worcestershire on the side for extra flavor. Also consider making a little onion gravy to spoon over the hamburger patty.